There is a general and very common misconception among the masses regarding the nature of car polish and wax and their respective uses. Generally, there is a perception that car polish is used to protect your car, whereas car wax is deployed to polish your car. Unfortunately, this distinction between the two is wrong in its very basics. The common assumption is that it is not possible to make use of one without making use of the other since both of them are complementary and it is not wise to solely use either car wax or car polish, since the benefits which are to be achieved from each are distinct from one another yet complement each other at the same time. Before going further into any philosophical debate, let us define the basic differences between car polish and car wax. What you ought to remember though is that the purposes served by each of them are entirely distinct from each other and you cannot expect one to fulfill or replace the function of the other. More than often, these two terms are used interchangeably, even when their uses are completely different. In order to differentiate the two, we will have to define them primarily. 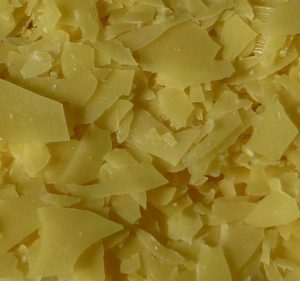 There are many guises and types of natural wax. The types and kinds of these waxes vary from vegetable wax to animal wax. These natural waxes have certain particular traits which make them appropriate for car waxes. At this point, carnauba wax is the most popular one in the automobile industry. The pertinent question which sprouts its head at this juncture is that what makes this wax ideal to be deployed in the automotive market. There are several factors which account for the appropriateness and adequacy of this wax. These factors have been listed below. It wouldn’t disappear after every downpour of rain or shower since its chemical bonding renders it insoluble. Not only is it insoluble, but its melting point is also very high, approximately 82 to 86 degrees centigrade. As a consequence, in hot summer afternoons, it wouldn’t melt off your car surface. Its finish is very glossy as well as durable. When it is combined with other ingredients, its application on your paintwork becomes very easy. These ingredients may include natural wax conjugated with silicone fluids, colorants, solvents and other waxes. There is another kind of synthetic wax which is popularly termed as ‘sealant’. This wax has some additional ingredients in it which make it more adherent. How Does the Wax work? When we say that the wax gives shine to your car’s paintwork, what we actually mean is that it fills in any imperfection which may be present in the paintwork, thus making it smooth and shiny. However, if your paint job is suffering from excessive oxidation and dullness, there isn’t much difference that this “filling in” would make to the car’s surface. There may be some hiding but the real problem would persist underneath the guise. Now that we have established what a wax is and how it works, let us now move on to what a car polish is and how it works. The principle on which a car wax works is contrary to that of car polish. While a car wax serves as a filler, the car polish is more abrasive and it tends to remove fine layers on the surface in order to flatten it out. This flattened surface then looks very polished and has the capacity to reflect light to a great extent. The abrasive action of these polishes does vary though. This degree of abrasiveness starts from coarse, goes on to medium and then to ultra-fine. How Does The Car Polish Work? A car polish of good quality would comprise of abrasives which have the tendency to dismantle and as they are rubbed into the surface, they continue to break down into smaller and smaller particles. The abrasive ingredients of many polishes are also conjugated with oils which endow them with a glossy look, so that your polished paintwork doesn’t only look smooth and shiny, but it looks glossy as well. that just as we mentioned formerly, they complement each other. Once the car polish has done its job and has flattened the surface of your paintwork, car wax steps in to protect this polish. 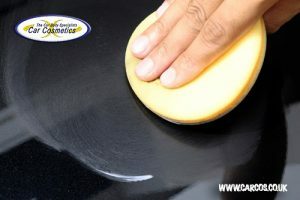 Polishing you car’s surface and attaining that deep gloss isn’t a piece of cake. So there must be something to protect it and this is where our car wax comes in. By using car wax you can successfully protect your polished paintwork for up to a couple of months. A number of factors of course have their respective parts to play in this. 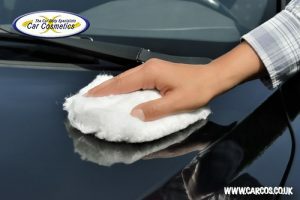 These factors include how frequently you use the car, for what amount of time is it stored, what environment it is exposed to and most importantly which kind of wax you have used. We have already explained the order in which you ought to use car polish and wax. However, just to make it more clear-cut, remember that your polish would remove layers from your paintwork, flattening it up and giving it a glossy shine. However, there is nothing to protect this. Your wax comes second acting as a chivalrous knight and can be deployed as a protective coating over the polished surface of your car. Bluntly put, there is only a fine line between car polish and wax. In fact, the line is so fine that at times this distinction almost seems blurred. The way it works is that you use the polish first to treat your car’s surface. This is then followed by wax, which is used to seal this polished finish. Having said this, you might come across certain products in market which may claim to perform both the functions of a car polish and a car wax. Experts however suggest that it is best if you use a specialized product for each job since it would yield comparatively better results. If you’d like to find out which car polish and wax are the best please follow this link.